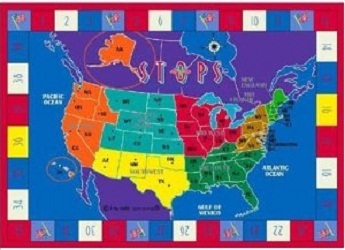 Why not dress up the kids room with a colorful rug featuring a map of the US. 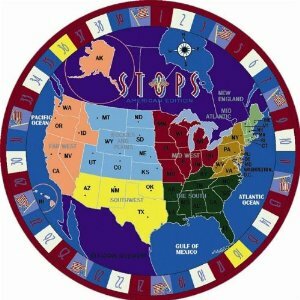 The Rectangular STOPS Trivia Game Rug is based on the award winning geography trivia game STOPS© so not only will the room look great but it gives your kids the opportunity to learn more about the United States. They can answer answer questions from landmarks and state capitals to American History which will help them to remember facts about their country. The American flag is displayed along with numbers, state abbreviations, the country regions and surrounding oceans. The rug has a Class I flammability rating.